There’s nothing like watching other people exercise to help you build up an appetite. And I can heartily recommend sitting on a terrace with swimmers ploughing up and down beside you in the bluest pool you’ve ever seen, with pastel-painted changing huts down one side. The Lido is tucked away in a mainly residential area of Clifton in Bristol. You have to be a member to swim there, but the restaurant is open to all-comers. It’s all stripped floorboards and bistro-style chairs and tables, with the occasional comfy sofa. And you can also eat out on the terrace if you don’t mind being splashed by enthusiastic swimmers. It’s picked up reviews in a couple of the nationals, including the Guardian and the Indie, and I note some of the online sites have been lukewarm about the quality of the food and the portion sizes in the evenings. A quick look at the menus that are available via the website suggests there’s not a lot there for vegetarians, and the breakfasts would be a non-starter for those of us who don’t eat eggs. Shame, as the swimming and brekkie package sounds fun. I can’t fault the lunchtime tapas menu, though. We were there for nearly four hours, and there was no pressure on us to move. We had coffee when we arrived, shared the tapas for lunch, splashed out on a glass of wine each, then went for the dessert, followed by more coffee. That came in at under £50 for two people. Tapas is always something I long to sample more often, but I rarely end up anywhere where there’s a decent veggie selection. And there’s always that indecision as to whether you won’t order enough or whether you’ll end up with so much left over that you’ll need a doggy pantechnicon to take it home with you. The last place I went to was a Spanish place somewhere near the Old Vic in London which looked like a slightly upmarket transport café, but which served a fantastic range of non-meat tapas. The Lido didn’t offer a colossal selection, but what they had was delicious – and there was plenty for two. 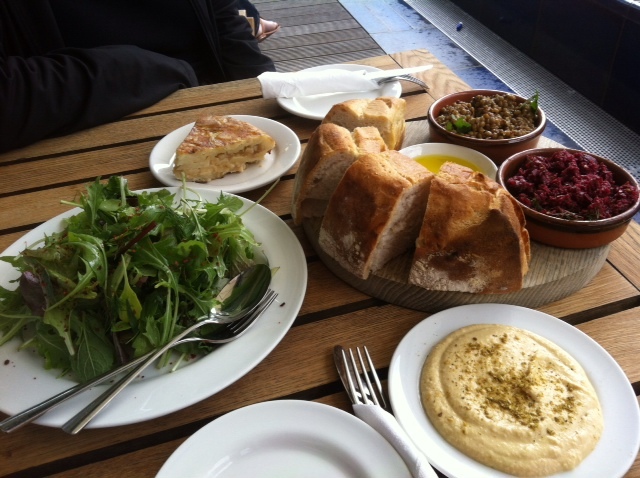 We ordered everything that was vegetarian – hummus, crusty bread with oil to dip, a green salad with a tangy dressing, a big slice of tortilla, a lentil dish, and beetroot and dill salad. I always tell people that aside from not eating meat, fish or eggs, I’ll eat pretty much anything. At a pinch I’ll eat things with egg in if it doesn’t taste eggy, but I’d rather not. The tortilla, though, turned out to be delicious – chunky and crammed full of potato. Beetroot is one of the foods I’m always slightly wary of – I blame pickled beetroot bleeding all over salads when I was little! People assure me that it’s yummy roasted, but I’ve never been quite convinced. I may give it another go after this dish, though. As for the delicately-seasoned lentils – I’d have eaten those two or three times over! Pudding was a chocolate and hazelnut tart – and it tasted like there was a splash of alcohol in there, as well as sea salt. I could happily have licked the plate. So the Lido turned out to be somewhere different and pleasant, and felt like a little oasis in the city. We’d got used to going to Brown’s in Clifton, which is a safe choice – but also limited on the veggie, unless you like pasta every time. I’d try the Lido again for lunch, but might need convincing to go in the evening.